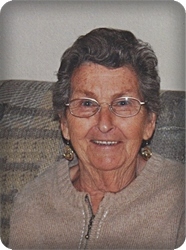 Geraldine C. Vader (Connor), age 87, of Grand Rapids, went home to be with her Lord on Friday, March 15, 2019. Geraldine was on the Brown Home Board and was a member of the W.C.T.U. She was a foster mother to many children. and loved to quilt in her spare time. She will be deeply missed by her children, Larry (Karon) Connor, Vicki Weaver, Diane (Steve) Lambright; nine grandchildren; 22 great grandchildren; five great-great grandchildren; sisters, Marjorie Moore and Patricia Wiman. She was preceded in death by her husbands, Gene Connor and Eldon Vader; and a granddaughter, Heather Lambright. The family will greet visitors on Thursday, March 28, from 5 - 8 pm and Friday, March 29 from 10 - 11 am at Stroo Funeral Home, where the service will begin at 11 am. Rev. Jon Stradtner will officiate. Interment will be in Blain Cemetery. Contributions in memory of Geraldine may be made to Hospice of Holland.